I hope you've been following along with our January #getseworganized challenge on Instagram. If not, no worries. 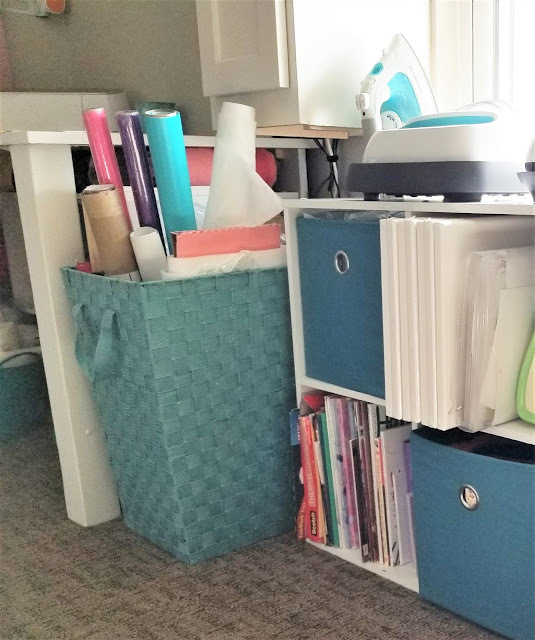 Basically we've been challenging our readers to get their creative space organized for the new year. 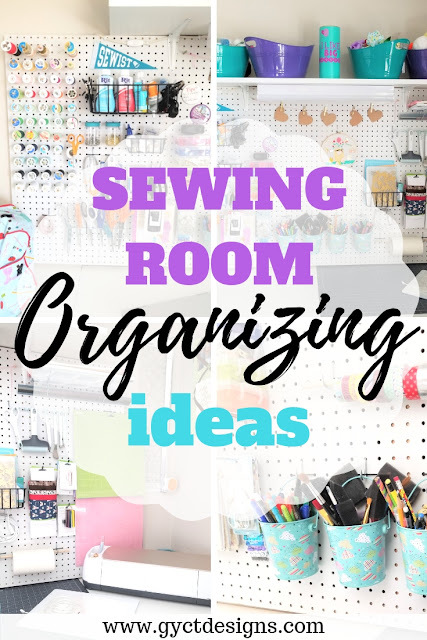 And in challenging you, we've had the chance to finally work on our own sewing room organization. Which has been awesome! 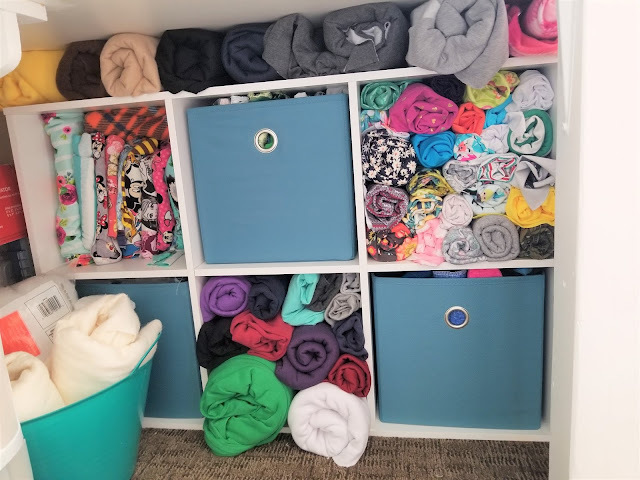 We all need organizing ever now and then. But we were in real need of it at our house. See, my parents moved in in the fall after selling their home and pretty much everything they own to go on a mission for our church. Which is amazing! But also meant I had to give up my sewing room. Yep, I had to move out. Of course I would do it. But it was a little painful and sad that after all the time I had spent planning my sewing room, it was gone. But no worries. I had a corner in our house that was all mine!! It just wasn't ideally set up for all the sewing and crafting I do. Lucky for me, I have a Dad that loves to design and build all. the. things. And he came to my rescue. I knew I wanted as much surface space as I could have. So I went with a U-shaped desk. 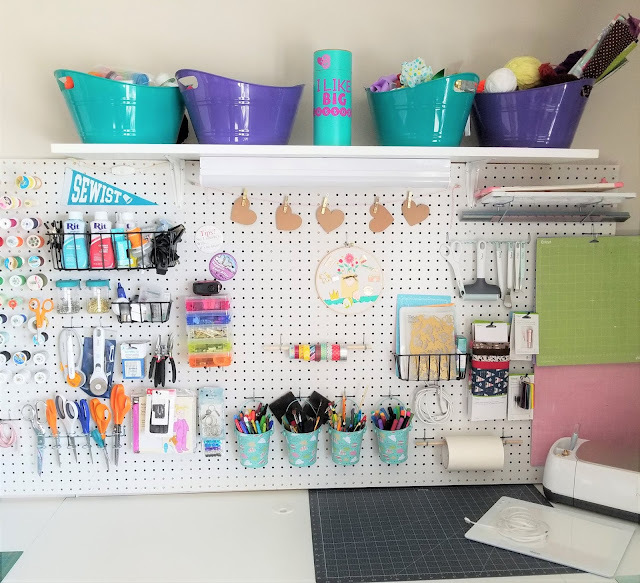 I also wanted a pegboard SO BADLY! One that could hold all the tools I use constantly but can't seem to keep track of because I have a toddler. 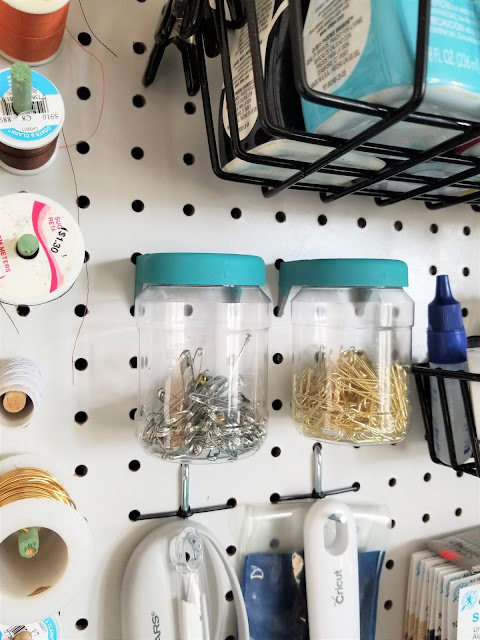 I had a pegboard previously, but it was way to small. So we got to work designing, planning, shopping, building. (When I say "we" mostly that means my Dad and my husband.) I took a little over a week to get all the parts together. 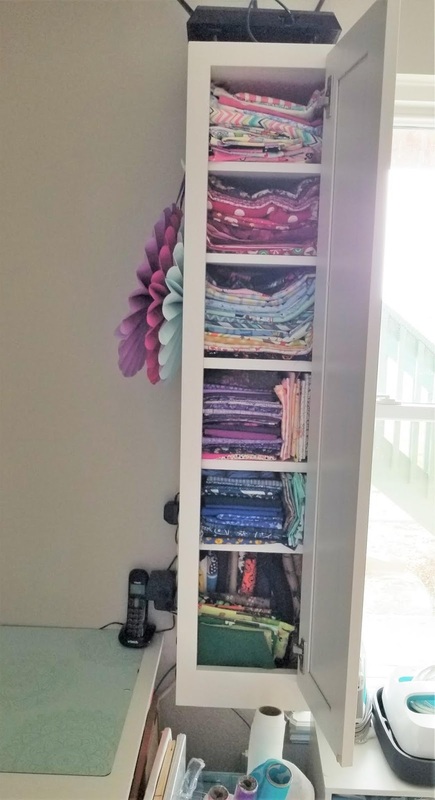 I already had some of the furniture, but we built the entire table and shelves from scratch - minus the cute narrow shelf hanging by the window. That was an AMAZING freebie that my brother in law had that was exactly what I wanted! Today, I wanted to walk you through some of the simple sewing room organization tips and ideas I've used that might help you get your creative space ready for the new year. 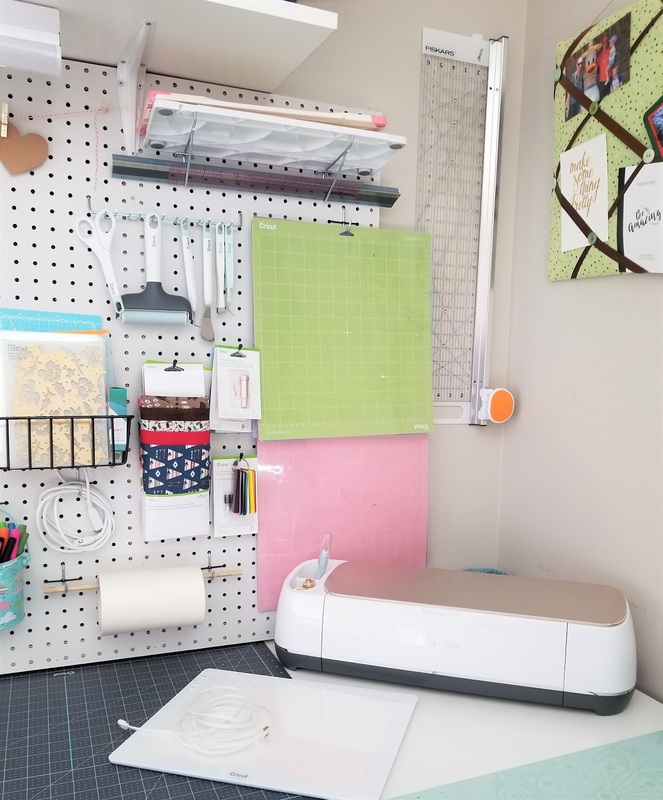 I decided I needed a corner for my sewing machine and a corner for my cutting machines, the Cricut Maker and Silhouette Cameo 3. (Yes, I have both. You can learn more about each in my comparison post.) 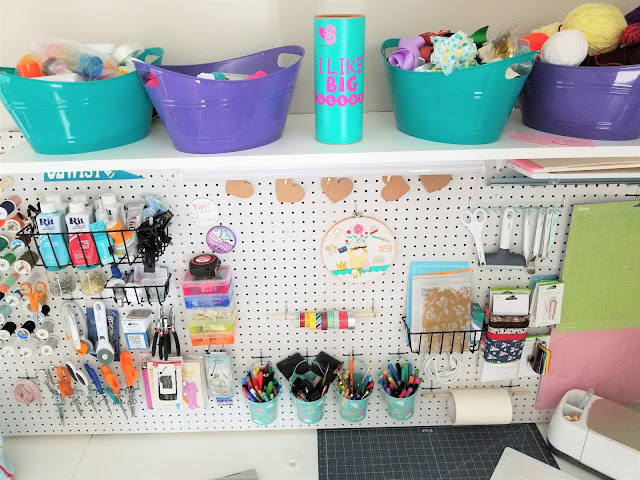 But having a corner for sewing and another for crafting really helped me nail down the best way to organize . 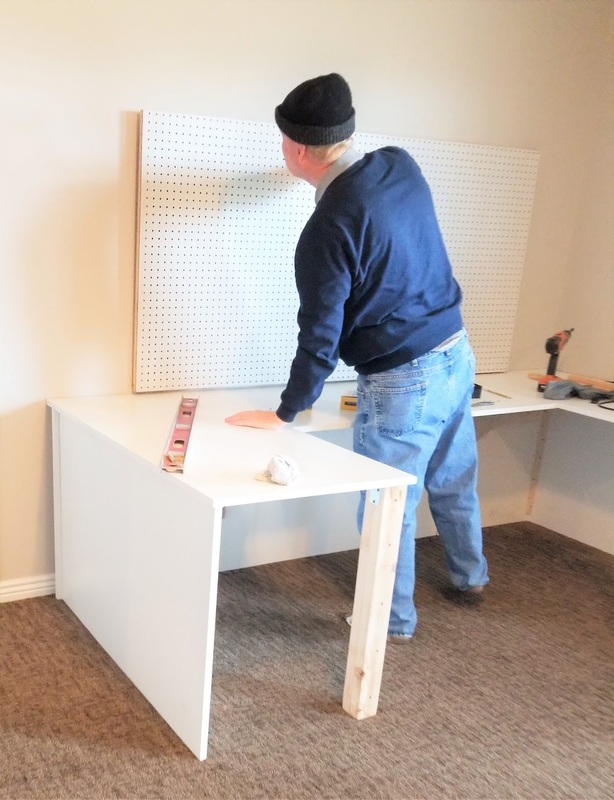 First, I got a BIG pegboard. Mine is 4 feet wide and 3 feet tall. 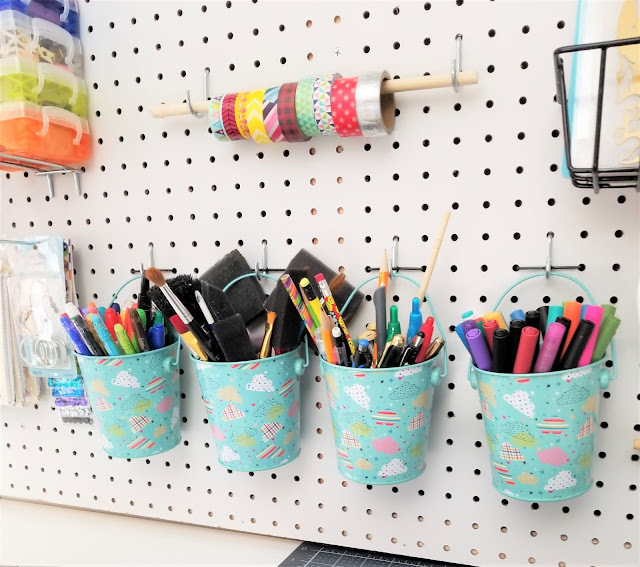 Since pegboard is inexpensive it is a great way to get organized because you can do SO much with them. Once we had my pegboard up, we head to Home Depot where I bought this great Pegboard Organizing Kit. I was a little skeptical at first as to whether it would be enough, but it had plenty of accessories and I still have a few I've yet to use. I wasn't sold on the "grey" colors, so I actually painted the lids of the two plastic jars. They fit my color scheme much better as well. You'll also probably want to grab some Pegboard Baskets like this set of 3 that I grabbed. I really like them. 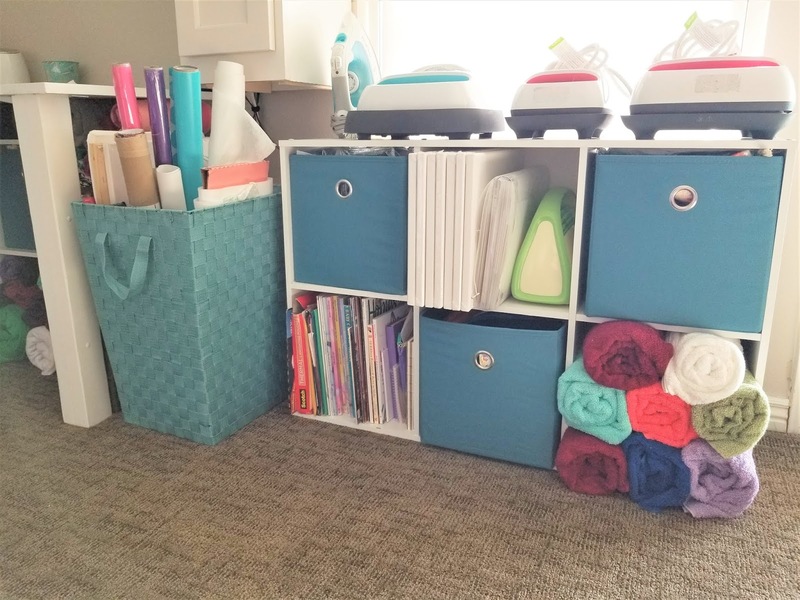 I actually also purchased a set of baskets similar to this set, but I didn't like how they looked on the board so I took them back. 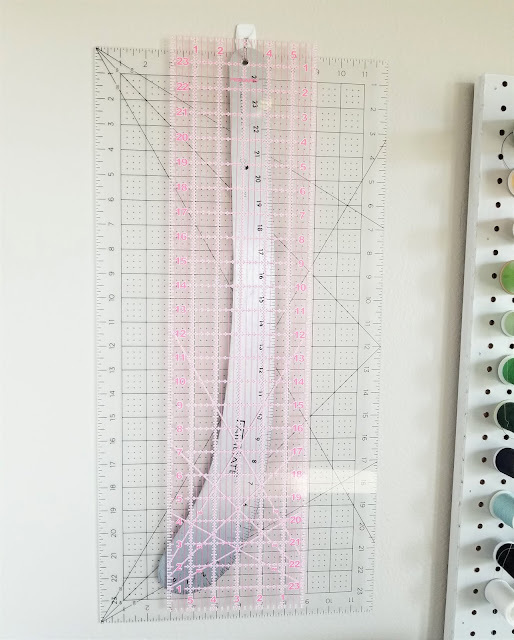 One of the most important pieces to my sewing room organization is making sure I have access to all my thread. 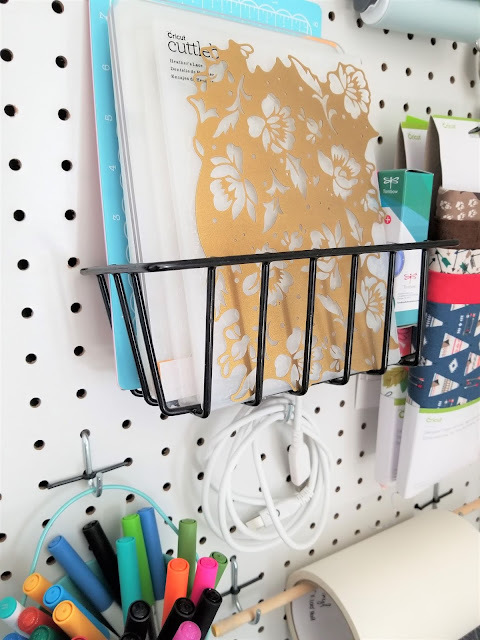 I cut wooden dowels into about 3" pieces and hung them on my pegboard. My thread fits perfectly and since I can see all the thread, I don't end up buying colors I already have and I can match thread and fabrics so much easier. 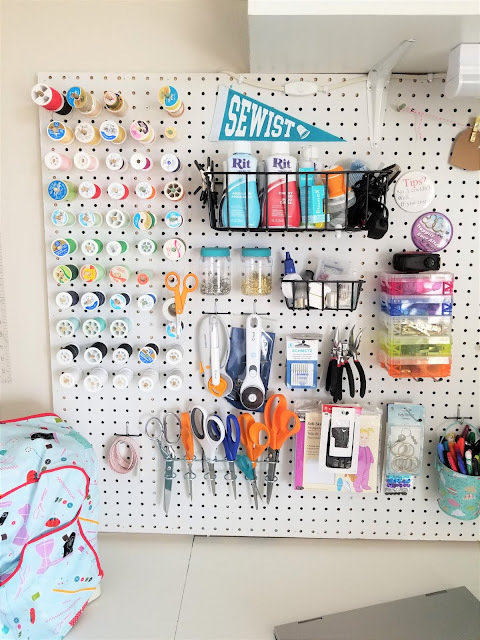 I also have access to all my scissors and rotary cutters right by my sewing machine. I also was able to finally lay down one of my self -healing mats. FOR GOOD!! It has a home - on a table!! Yes, that is a super exciting thing for me. 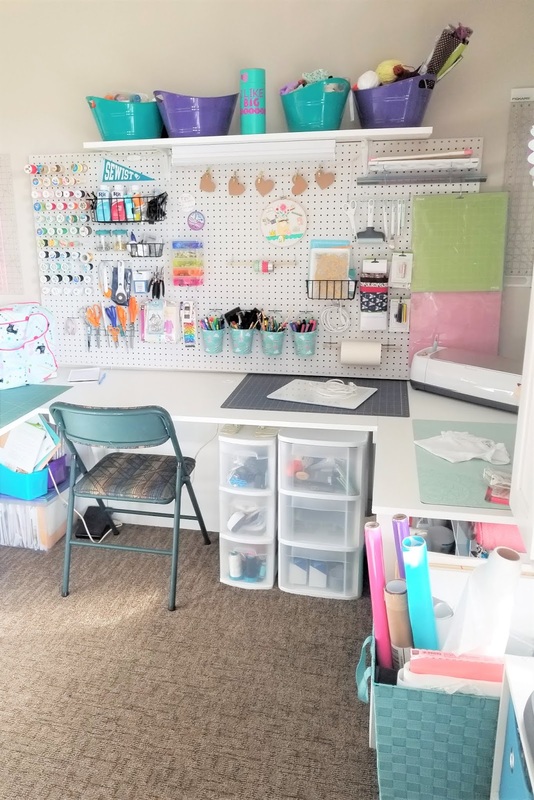 In the opposite corner is my crafting area. I have my Cricut maker. But I was able to hang up all my cutting mats, tools, blades and even my transfer tape. Everything is right at my finger tips. I also grabbed these little buckets that are the perfect way to store my markers, pens and paint brushes. It was one of the many sewing room organization ideas I found on Pinterest. 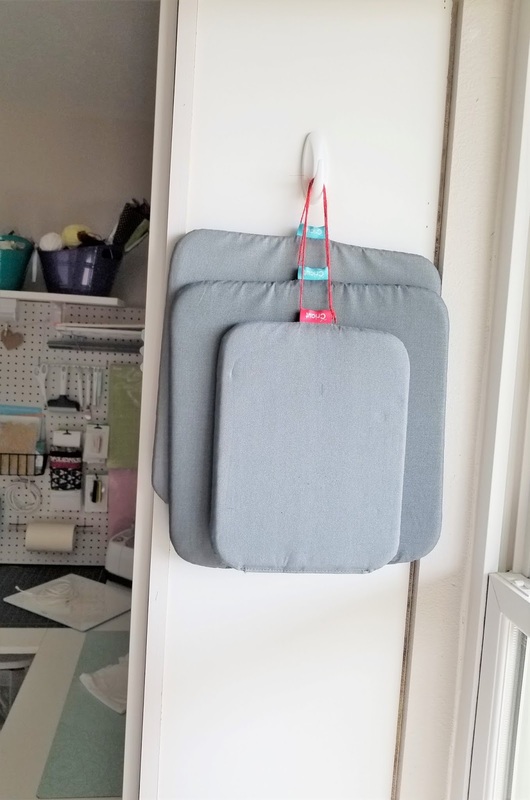 I asked for a shelf above my pegboard so I could store even more stuff. I found these tubs at the Dollar Tree that were exactly my color scheme. They have ribbon, yarn, glues and paint in them. I love that they are in reach for me but out of reach of my kids. .....and one for my crafting blanks like t-shirts, towels, and canvases. I also now have a place to store my Cricut EasyPress!! They didn't not really have a home before now. To hang up my EasyPress mats I tied a piece of twine through the label and used some 3M Command Hooks to hang them. 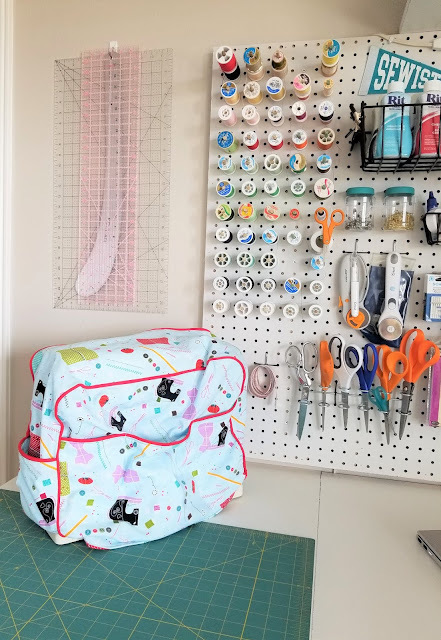 I also found this tall laundry basket to hold wrapping paper, large vinyl sheets, and bolts of interfacing. It fits perfectly between my table and my 6 cube unit. Lastly, my vinyl. It will be underneath my sewing machine in an Ikea Alex Drawer Unit. But since I don't have an Ikea close by, I have to wait for my next trip. We actually built the table so that the drawer unit can slide out the side to extend my sewing table. That way I can use it for extra table space, for photos or as another cutting surface. There you have it. I love how simple this sewing room organization is. But it is so perfect for what I need. 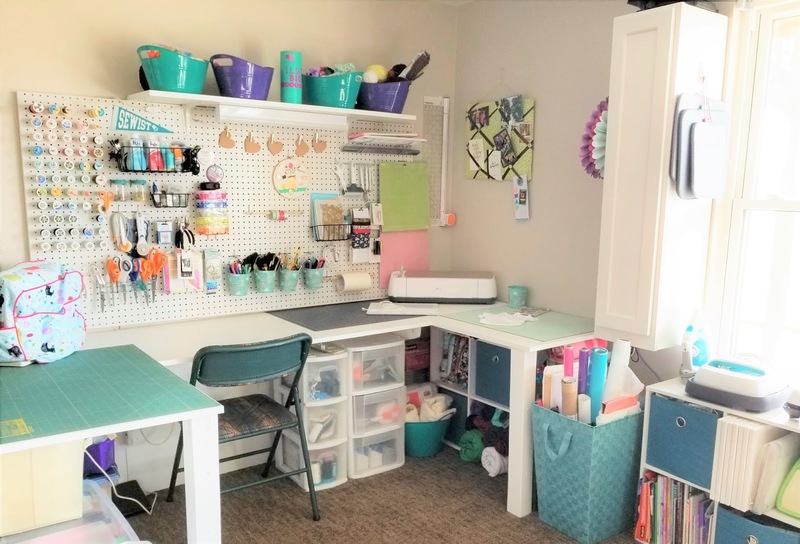 I hope my space provided you with some inspiration and ideas for your own creative space.